So, my RC time constant is not in fact proportional to R.
Not sure if this is a beginner's question, but I certainly feel embarrassed asking it. 4 years of engineering school and I have no idea what could be causing this behaviour! 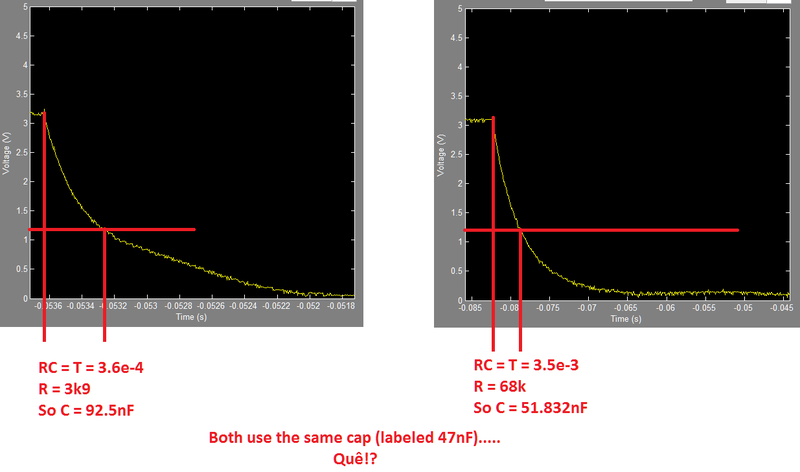 Anyway, as mentioned in the title, I've simply tried to measure the capacitance of a "47nF" ceramic cap, by connecting it up to a 3.3V square wave through a resistor, measuring RC, then dividing by R.
And, really oddly, my measurements showed that the time constant was either not the direct product of R and C, or that C was changing significantly depending on R.
I took multiple measurements using multiple methods (automated software which would detect the time between the 2.5V and 1V passings, then dividing this value by R*ln(2.5), doing the same thing by hand, and also checking the time from when the signal first dropped to when it reached 37% of it's initial value) multiple capacitors, and multiple resistors over multiple days. The higher the resistance went, the lower the capacitance went! The measured capacitance would be roughly the same as the rated capacitance when R = 50k to 100k, and it would be about double when R = 1k to 10k. I understand that the components are non-ideal (they're voltage-dependent, have a tolerance and there is a parasitic L and R, at least), but can I really expect the measured capacitance to double when changing from a 5k to 50k series resistor? Is that a normal thing that happens, or am I going insane!? Bachelor of Engineering (ECSE) with Honours. Every time I write a line of code or build a circuit I am reminded that, in the grand scheme of things, I know bugger all. Re: So, my RC time constant is not in fact proportional to R.
Signal source is a microcontroller DAC fed into an LM324. R2 is a 3.3k, and R1 is 2 3.3ks in parallel (so, 1.65k). However, there is a MOSFET (2N7000) between R1 and GND, so I can swap between unity gain and 3x gain through software. The MOSFET was turned off when making these measurements (0V on gate). There is something amiss with your measurement system. Look at the first graph, I could believe the decay is exponential up to the 37% marker, but then it becomes almost linear down to the base line. The LM324, does it have a negative supply or is 0V the lowest voltage in your system? No negative supply, but I don't think that'd be the big issue (especially because below). Good catch on the shape of the graph, I just assumed it was "normal enough" for some reason. Ahh, that would make a difference. (I think I read +-40mA somewhere on the spec sheet and assumed that it could source and sink fairly evenly). I'll try measuring using the rising edge instead and see if the results are more reasonable. nice in that they drive very close to both supply and ground at low currents. Ahh, thanks for the tip, Bob! I'm sure that little fact will come in very useful throughout the career! And thanks for the solution, Rerouter. Everything's working now (just changed three lines of code to make it find rising edges instead of falling. Oddly, all of the measurements seem to be about 20-30% above rated capacitance, but this is constant across all measurements so I think I can deal with it). Is the error also consistent across changes in R as well as C? If so, that suggests a time base error. If not that suggests an un-modeled chunk of source impedance. Yeah, constant across all R as well as C. Probably just a slightly off sample rate or similar. I should look at that today, actually. EDIT: Don't want to bump the thread, but worked out what it was. Was just using the wrong formula to calculate the capacitance (I wasn't subtracting the two points used from Vcc). This just happened to give me a 20% error with the two points that I chose. Well, 20% is a whopping big error for a timebase. If the error is more than 0.02% on a modern sampling scope, I'd be surprised.